As the Middle East edges towards another era of convulsion with President Trump’s decision about Jerusalem, a new book helps put the turmoil in perspective. 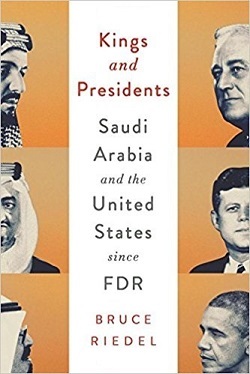 Kings and Presidents: Saudi Arabia and the United States Since FDR is a timely analysis of the relationship’s history, a careful and respectful dance between a democratic superpower and an autocratic monarchy, in managing common interests including the oil trade and security since 1945. Author Bruce Riedel’s perspective is insightful due to his long career with the US Central Intelligence Agency followed by positions with the US National Security Council, the Department of Defense and NATO. Over the course of a seven-decade alliance with the United States, Saudi Arabia has consistently emphasized one foreign-policy goal – resolution of the Palestinian conflict with Israel and end to Israeli occupation. But with new players, the alliance has entered a new phase with tradition, cautions and promises shoved to the side. The unresolved Palestinian crisis is the book’s most persistent theme. The book’s final chapter addresses the issue as one of three major stumbling blocks to Saudi-US relations along with women’s rights and religious extremism. And the book offers ample context for the newest players, Donald Trump and Crown Prince Mohammad bin Salman bin Abdulaziz Al Saud. Saudi leaders may have seen promise of good ties wth Trump, and Riedel describes the president’s May visit to Saudi Arabia and lavish welcome. But Riedel also outlines a number of “near death” experiences over the years for the alliance and expresses wary anticipation for more unpleasant surprises. Franklin D. Roosevelt met with King Abdul Aziz bin Abdul Rahman al Saud in 1945, seeking support for displaced Jewish people as World War II ended and exposed the horrors of the Holocaust. Roosevelt promised that the United States would pursue “full and prior consultation with both Jews and Arabs” before adjusting policy, but King Faisal was soon disappointed by Harry Truman’s support for establishment of Israel. Dwight Eisenhower pressed for Israel’s withdrawal from Jerusalem. King Faisal expressed doubt to Richard Nixon that real peace could be achieved without Jerusalem’s return to Arabs and Palestinian self-determination. Jimmy Carter, determined to achieve a peace agreement when entering office in 1977, saw danger in an independent Palestinian state and managed a separate deal with Egypt. Ronald Reagan called for Israeli withdrawal from the West Bank and Gaza Strip and the creation of a Palestinian confederation with Jordan. King Fahd, insisting that the Palestinian issue was the source of turmoil for the region, responded with a plan for creation of an independent Palestinian state with Jerusalem as capital. George H.W Bush and Bill Clinton each focused intense diplomatic efforts on negotiations. Crown Prince Abdallah refused to meet with George W. Bush without action on the issue, and that president offered the first formal American commitment to a Palestinian state. Barack Obama also tried to revive the peace process, and Trump promised to do the same. But years of inaction on the Palestinian issue may have taken its toll. The United States under Trump has lost interest in the pursuit of democratic reforms, and Saudi Arabia has come to regard its rival Iran as the region’s biggest threat. Alliances throughout the region shift quickly and for short-term purposes. The United States partnered with Iran under the Shah until the revolution in the late 1970s. The United States supported Iraq during the war with Iran in the 1980s, but then joined Israel by also supplying weapons to Iran. The United States went to war against Iraq after its 1990 invasion of Kuwait. The United States supported the mujahedeen in Afghanistan during the Soviet intervention of the 1980s before launching its own intervention there in 2001. Riedel’s narration and anecdotes make the history a pleasure to read though Readers cannot help but wonder how much is left unsaid due to his commitment for confidentiality. A relationship between polar opposites like the United States and Saudi Arabia depends on trustworthy intelligence that envisions long-term opportunities and ramifications. Ultimately, though, quality of leadership and personality decide what intelligence is used and how. For example, the Saudis were prophetic with their criticisms prior to the 2003 US-led invasion of Iraq, but then linked commitment to plans for toppling Saddam Hussein to meaningful progress on the Palestinian issue. Neither side appreciates intelligence surprises – the October 1973 war and the subsequent oil embargo, the Iranian revolution, the Soviet invasion of Afghanistan, Iraq’s invasion of Kuwait, and the 9/11 attacks. Saudi Arabia was also distraught by George W. Bush failing to follow his father’s lead on Palestinian peace talks, Obama’s expectation that Saudi Arabia accept Guantanamo prisoners, and Obama’s quick support for regime change in Egypt after the Arab Spring. Saudi Arabia is intent on protecting its absolute monarchy, and Riedel describes the challenges of securing accurate information behind good deal-making and knowing what the other side really wants. US diplomatic and defense officials rely on Saudi counterparts – the United States has had 27 ambassadors or chargé d'affaires sent to Saudi Arabia; Saudi Arabia has sent 10 to the United States. That said, Riedel’s book begins and ends with appreciation for Prince Bandar bin Sultan bin Abdul Aziz who served more than two decades as Saudi ambassador to the United States between 1983 and 2005 and an envoy afterward. Bandar’s name repeatedly emerges in the book as an innovative problem-solver, dedicated “to persuade Americans, especially American presidents, that the Kingdom is America’s most reliable and influential ally in the Islamic world.” The book offers intriguing examples of information passed along, tested informally, through intermediaries like Riedel and Bandar. Kings and Presidents concludes with a memo that Riedel wrote for Obama, outlining the reasons why revolution is no longer unthinkable in Saudi Arabia and why the United States could not intervene. The world will decide if the United States and Saudi Arabia are forces for order or chaos. Two inexperienced men, Trump and Mohammad bin Salman, now manage the alliance. Both nations struggle with unsustainable budgets, debt and transition in energy sources. Both have big military ambitions that are costly. Both men dispense with traditions and reject advice from experienced career personnel, and neither hesitates to engage in aggressive foreign policy despite intense concerns that fuel extremism at home. The partnership may continue or sour after the momentous Jerusalem decision. Either way Riedel’s timely book offers excellent background. Susan Froetschel is editor of YaleGlobal Online and the author of mystery novels set in Afghanistan, the most recent of which is Allure of Deceit, published by Seventh Street Books. The books explore the influence of globalization at the local level.